Remember this super hit song sung by singing legend Mohd Rafi in the film BAIJU BAWRA, where Baiju, a music enthusiast is begging to his teacher to give him his blessing. Written by eminent lyricist Shakeel Badayuni and composed by music wizard Naushad the song is still a hit and so are its apt words that beautifully capture the significance of a teacher in our life. True a teacher plays a pivotal role in refining the talent of his students and it is his meticulous nuances that make the student greater than his Guru! However it is a tragedy that in today’s jet age world there are hardly any students who revere their teachers with such esteem and admiration! But all are not the same there are few gifted souls who never fails to esteem their Gurus and despite reaching the peak of popularity and stardom they bow to their Gurus as they did when they met them the first time. Recently distinguished music director and Oscar award winner A.R. 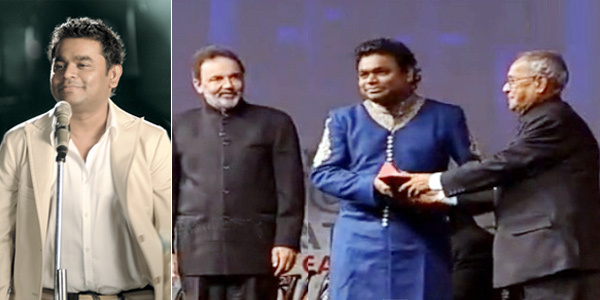 Rahman paid his ode to his gurus while receiving the prestigious Global Living Legend Award from the Adding Smiles Foundation. Going memory down lane Rahman reminisced that his first Guru as a music teacher was none other but his father R.K. Shekhar, who was a popular music composer and used to help out many musicians.